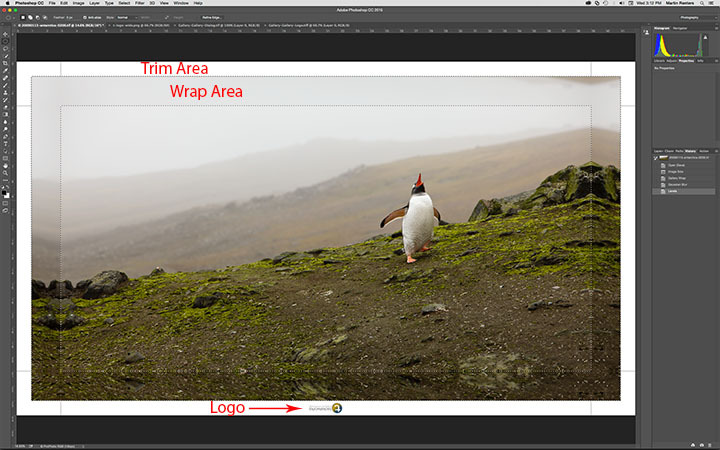 An updated Photoshop Gallery Wrap script that creates a mirrored or plain border to prepare it for printing and eventual wrapping. Gallery Wraps are a popular way to display art. The process involves stretching the edges of the canvas over a wooden frame and enough extra canvas needs to exist around the image to wrap around the frame. In order to not lose parts of the image, the canvas needs to be extended all the way around the image. This can be either a solid colour or it can be mirrored from the image itself. This script creates a mirrored or solid color border. A number of people have emailed me asking for additional features and this update includes most of them. Download and unpack the ZIP file. Open a Photoshop image and then click on File→Scripts→Browse and select the GalleryWrap.jsx file in the folder where you unpacked the ZIP file. 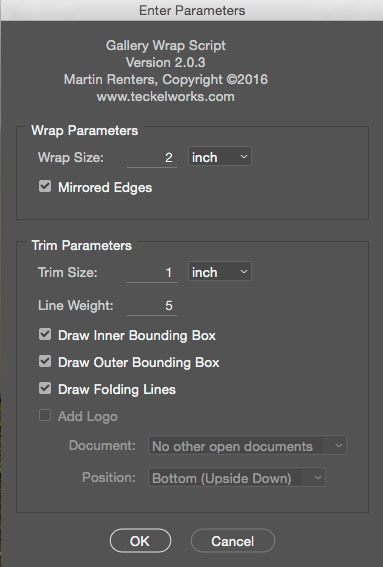 More detailed instructions can be found in the Gallery Wrap Instructions PDF file included in the ZIP file. Tested on Photoshop CS5 and CC 2015 on Macintosh. Reported to work on Windows. If you find this script useful or you’re having problems getting it to work, feel free to send me an email.